BIRN Hub Resonant Voices Initiative (RVI) is a network of journalists, activists, and community leaders who challenge dangerous messages online, map online radicalisation trends, and provides training, mentoring, and technical support to counternarrative campaigns. BIRN Romania The project aims to foster mutual understanding among people from Moldova and Romania by creating a network of human interest stories (print and audio) related to what does it mean to be a Moldovan citizen today in relation with a Romanian one, in an era of geopolitical tensions and radical social change. BIRN Serbia Through this project, BIRN will encourage the participation of civil society in the process of increasing transparency of public spending for media. BIRN Serbia Promotion of judicial transparency and accountability through investigative reporting. BIRN Hub The project aims to strengthen investigative reporting in Montenegro, which is being implemented by BIRN, CIN Montenegro and Monitor magazine. The project was funded by the EU Delegation in Podgorica. BIRN Hub The programme focuses on building the capacities of local media and civil society in order to promote reconciliation and intercultural dialogue. BIRN BiH The programme is dedicated to monitoring and reporting on cases of organised crime, corruption and terrorism. BIRN Macedonia BIRN Macedonia, in partnership with the Center for Civil Communication and NGO Info-centre, is implementing the project Investigative Reporting to Boost Reforms. BIRN Kosovo The Paper Trail Investigations is a project by Balkan Investigative Reporting Network - BIRN Kosovo and BIRN HUB – to promote the rule of law, accountability and transparency in the Balkans and Moldova. 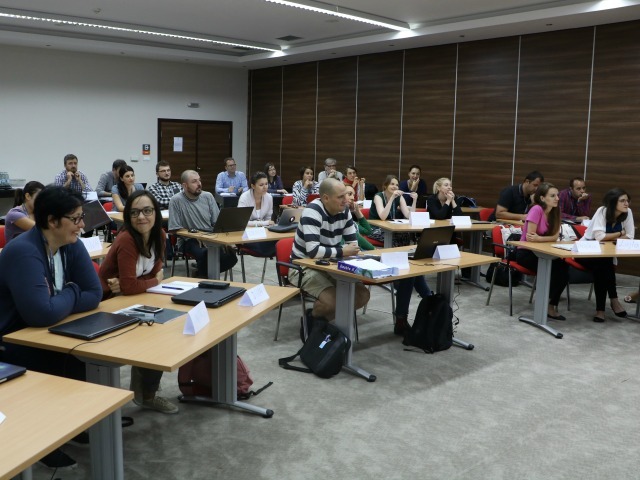 BIRN Hub The BIRN Summer School of Investigative Reporting works to enhance the reporting skills and journalistic standards of journalists from the Balkans and beyond, training 20 journalists from the Balkan region and 10 international journalists each year. BIRN Hub Through its Balkan Fellowship for Journalistic Excellence programme, BIRN works within the region to foster quality reporting, initiate regional networking among journalists and advance balanced coverage on topics that are central to the region as well as to the EU. BIRN Hub The Alumni Network, drawing on the work of the Fellowship, aims to promote the ideas of journalistic excellence and spread the concept of free and professional media throughout the region. BIRN BiH BIRN BiH's Justice Series programme is the organisation's flagship effort that was launched in 2005, which aims to increase understanding of and support for the work of the war crimes trials in Bosnia and Herzegovina and the region.